Blend of functionality, durability and looks, this custom trash receptacle displays advertisements or messages in two easy-to-change panels on either side. Includes a set of two custom printed panels per receptacle. Full customization with a center laser-cut image or logo of your choice that displays on front facing side between the two panels. 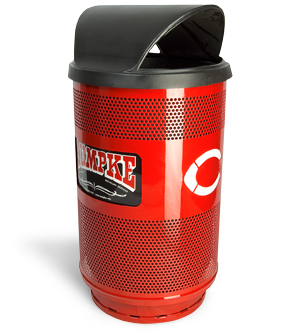 Made of heavy gauge solid and perforated steel, this durable trash can may be used indoors or outdoors. Top lid options include flat top, hood top and dome top. 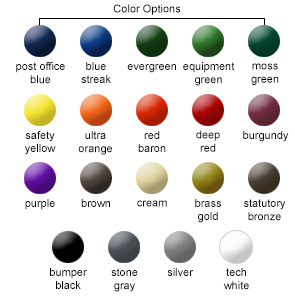 Available in powder-coat finish color options shown below. 35 gallon and 55 gallon receptacle bases are dipped in corrosion resistant plastisol for added durability and will match your chosen receptacle color. Made of Heavy Gauge Steel. Durable Plastic Liner and Lid Included. In order for our laser technicians to produce the most accurately cut panels possible, we require that you supply the artwork in any of the recommended or accepted formats listed below. If you have any questions, please feel free	to contact us and we'll be happy to explain exactly what we need to ensure our laser cuts are precisely what you're looking for. Some artwork may require inclusions called tangs which are slender strips that connect artwork to surrounding metal for stability and to prevent bending. Insertable panel artwork should measure one inch larger than ad opening on all four sides. Example: 8" x 11" insert will fit 6" x 9" opening. One time laser cutting file creation Set-Up Fee of $400. $150 Resizing Fee for Addtional Receptacle Sizes with same logo in lieu of Set-Up Fee. Set-Up Fee is applied on initial orders only, it will be waived on all subsequent orders using the exact same artwork. All artwork is kept on file. Receptacles and Set-Up Fee will appear as separate line-items on the order form.